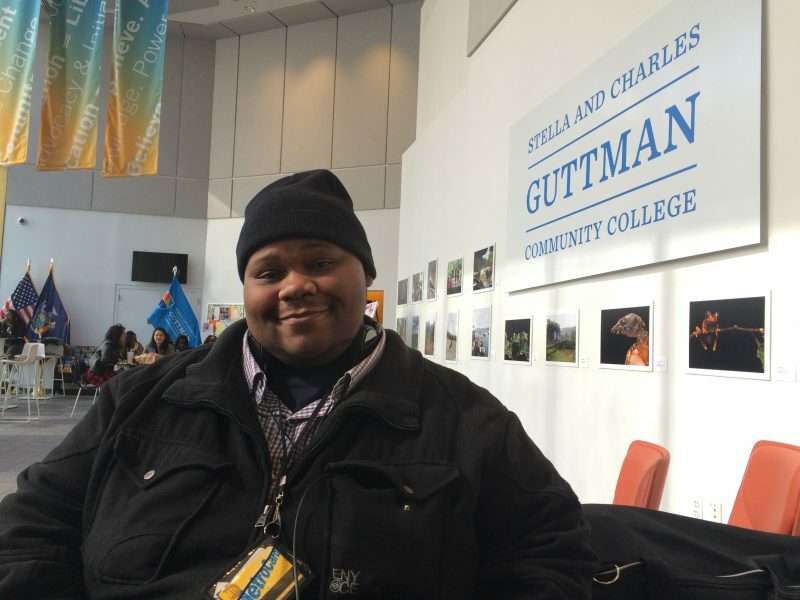 QUEENS, N.Y. — Wendy Thompson always knew she wanted her son to go to college, but she didn’t realize so many people would disagree. But when Thompson met with a counselor from the state agency that is supposed to help people with disabilities get training or a degree that will lead to a job, the counselor refused to sign off on her son’s plan to go to community college. That meant he wouldn’t get wheelchair-accessible transportation, tuition help or voice-activated software from the agency — all of which he qualified for under federal law. Thompson’s frustration is shared by people with disabilities and their parents nationwide. More than 800,000 people with disabilities found eligible for services received no assistance between 2010 and 2014, according to federal data. More than a dozen states failed to provide services to over 40 percent of those they themselves deemed eligible. And many more states have left people in limbo for months, despite laws that expressly forbid that. Nationally, 76 percent of people with disabilities have high school diplomas and only 12 percent have college diplomas. “It’s happening across the country, and it’s inexcusable,” said Ron Hager, senior staff attorney at the National Disability Rights Network. This despite $3 billion in tax dollars spent last year by the agencies responsible, known as Vocational Rehabilitation (VR) offices. Created by the Rehabilitation Act three decades ago, VRs are supposed to help people with disabilities become independent. Some people need a hearing aid, for example; others require voice-activated note-taking software or screen-readers for college. Studies have shown that people with disabilities benefit even more than the general public from having a college degree, in terms of employment and getting out of poverty — people with disabilities with a bachelor’s degree are almost 50 percent more likely to have a job than those with just a high school diploma. Yet, while 76 percent of people with disabilities have high school diplomas, only 12 percent have college degrees. Some VR agencies work well; counselors respond promptly to applications and help clients further their education and secure employment. But in many states the VR offices are understaffed, poorly run or hamstrung by political battles. Staff turnover is high, successful job placement is fleeting and money is spent without significant results. Delays in service provision were so widespread that, in 2014, Congress mandated that a person with a disability must receive a plan for employment within 90 days of being deemed eligible for assistance. In 20 states, more than one-third of cases stretched past the 90-day limit in 2015. Close to 14,000 cases stretched past a year. Once an applicant gets an approved plan, the next step is to get the services — which often takes even longer. The delays lead to missed job and educational opportunities and longer government dependence, all at a cost to taxpayers. Part of the problem, advocates say, is high caseloads. The situation is most severe in urban centers. The recommended caseload per VR counselor is between 80 and 100 clients. But in the Bronx, for example, the average caseload rose to 270 in 2016, up from 222 in 2015. The current New York statewide average is 185, according to state officials. Josh Greene, who has several learning disabilities, felt the impact of those high caseloads firsthand. He lives in the Bronx, and in the fall of 2014, he was brimming with hope. He had his first appointment with a counselor at the Bronx VR agency. He was found eligible for services and was accepted that spring to Guttman Community College in Manhattan. Related: Students on the autism spectrum are often as smart as their peers, so why do so few go to college? It went downhill from there. Greene has dyslexia and needed software to help him take notes without scrambling the letters. He also needed an audio recorder so he could listen to lectures again at home, and some extra help with writing. He spent 10 months emailing, leaving messages and resubmitting forms, but by the following September when he started classes, he still had received none of the academic assistance for which he had been approved. A spokeswoman for the Education Department, which oversees New York’s VR office, said the agency could not comment on individual cases, but acknowledged that turnover among Bronx counselors was about 30 percent last year. New York isn’t the only place struggling with high caseloads. The backup in Milwaukee is so severe that it is not uncommon for people to wait six weeks to get a first appointment to begin the eligibility process, said Cathy Steffke, an advocacy specialist at Disability Rights Wisconsin. 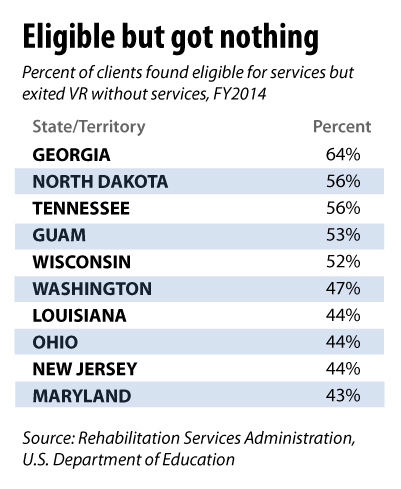 By law, VR caseworkers must have a master’s degree, but in most states their pay is lower than that of their counterparts at the veterans administration or the department of education. The private sector pays even more, so many people leave after just a few years, passing on their cases to less-experienced counselors who already have their own loads. “I think more people would stay, even with lower pay, if they felt like they had the possibility of helping people,” said a recently retired caseworker who spent close to three decades at a Wisconsin VR office and asked to remain anonymous because he still works with the agency. Of the 22 co-workers when he left his office less than two years ago, only two are left, he said. Statewide, 30 percent of casework-related staff left between 2012 and 2015, according to a state audit. In 2013, Governor Scott Walker became the first Wisconsin governor in more than a decade to put up the full amount of state matching funds for Wisconsin’s VR. Walker supported moving people from government assistance to work. Nonetheless, the number of counselors in Wisconsin has stayed flat since 2012, according to a state audit, although there has been an increase in the number of counselors in training. State officials say that new initiatives, including one that enlists the counselors in training to handle some eligibility-related tasks, allowed them to successfully close a record-number of cases last fiscal year. The Wisconsin waiting list now averages only 150 people at a time (down from 4,900 in 2013), according to John Dipko, communications director at Wisconsin’s Department of Workforce Development, and the agency has streamlined its intake process. High caseloads translate into delays and lack of services for people like Amy Kerzner. Multiple sclerosis struck Kerzner relatively late in life, making it impossible for her to keep working as a nurse. She met with a VR counselor in Calumet County, where she lived, who approved her plan to attend Alverno College in Milwaukee so she could get training to become a psychologist. She moved to Milwaukee in October 2010 and called her new caseworker there — repeatedly. Even though the paperwork had been transferred and she was due to start classes in January, she couldn’t get an appointment until March. She began the program anyway. “He kept making appointments and canceling, not returning emails,” she recalled. When she finally met with the caseworker, he told her that he was denying her request to attend Alverno. She called an advocacy hotline, appealed the decision and won, although it took several more months before she was reimbursed. Wisconsin VR officials dispute Kerzner’s account of her treatment. They say they have requested but have not received permission from her that would allow them to make the details of her case public. Steffke says Kerzner’s experience is not an anomaly. “These people just want to work, they just want a job, they’re not asking for cars and boats and property,” she said. Yet high caseloads are not the only reason that some people leave the system without receiving services, according to a U.S. Department of Education spokesman. 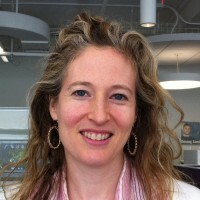 In light of a shortfall of funding, some states have created waiting lists to prioritize the most disabled, so clients on the waitlist who have been found eligible for VR services but whose needs are less “significant” may be redirected to other agencies, such as a Veterans program if the disability occurred due to military service. Federal funding for VR has dropped by 6 percent since 2009, accounting for inflation. And 21 states did not put up enough state money in 2015 to get the full amount of federal matching funds. The failure to fund is shortsighted, say advocates. Not only does a successful job placement reduce government assistance rolls, they argue, but when services for clients are denied or delayed, the agency is still spending time and money on those clients. In 2012, VR agencies around the country spent close to $365 million on people who left the system before they completed services, and that’s up from $326 million in 2009, according to a study from the University of Montana. In Louisiana, 44 percent of people found eligible for services never received any in 2014. This year, statewide budget cuts forced an even worse crisis — the office ran out of money and stopped taking new clients on February 29. In addition, hundreds of people who had been found eligible but hadn’t gotten approval for their employment plan also had their cases put on hold. The office reopened its caseloads on June 1, and counselors are now wading through the backlog. “It’s had a big impact on everyone,” said David Gallegos, program director at the Advocacy Center of Louisiana who has been working there for 17 years. Caseloads in New Orleans are now between 150 and 200 clients, said Gallegos, who is also the state’s CAP director. 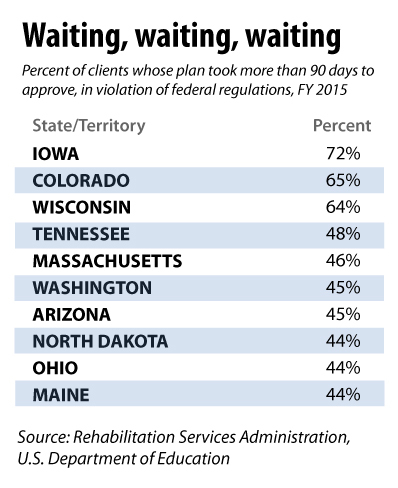 Similarly, in January 2015, Tennessee’s agency also temporarily stopped taking new clients. Although it has opened its doors again, a state report found that 100 of the 243 positions that provide direct services to clients were vacant last year. The result has been caseloads of up to 200 in Knoxville and elsewhere, and many dropped clients, advocates say. Tennessee is actively hiring, said Devin Stone, spokesperson for the state Department of Human Services. Stone added that over the past four years, the agency has increased the number of clients getting jobs each year; advocates say things have gotten worse. People with disabilities and their advocates in many states also say that even when applicants do get plans and see counselors, the results are disappointing due to the counselors’ skepticism about their abilities. Loria Richardson, a project specialist from the nonprofit advocacy group The Arc Tennessee, said she has seen this happen on numerous occasions. She is currently working with a young man who was accepted at the Tennessee College of Applied Technology. He visited the school, met with instructors and decided to enroll in its HVAC program. School officials said it was not a problem that he had graduated high school with a special education diploma. They assured him that others without regular diplomas had been successful there, and that they would work with him to provide accommodations, such as digital access to class readings so he could use headphones to hear the required texts. Yet when he applied to VR, although he was immediately found eligible for services, his case manager said she did not think he would be able to complete the HVAC class. She was not moved by the school officials’ opinion, the young man’s successful four-year employment history, or the fact that he had a driver’s license and could already perform basic car mechanic tasks. Richardson is now trying to help the young man find other forms of financial aid so he can enroll at TCAT. An HVAC assistant — the job he aspires to — starts at about $15 an hour, which would be a big step up from his current job where he makes minimum wage. Similarly, in Ohio, a VR counselor determined that a woman with spina bifida was incapable of handling college and refused her request for assistance. The woman managed to cobble together financial aid from other public agencies and got her associate’s degree. Yet when she returned to the VR office to seek help for a bachelor’s degree, she was again deemed ineligible for college. It took a lengthy appeal, but she eventually won and got the assistance she needed. She graduated two years later and landed a job as a social worker. Many people with disabilities say that such bias is not only offensive but also threatens the independence they desperately seek. The poverty rate for people with disabilities is 30 percent, twice that of people without a disability. But a college degree makes a difference.